An obsessive fan resorts to kidnapping to keep his favorite actors together in Joel Kim Booster's remarkably savvy, of-the-moment comedy. As a member of the Potter generation, I can trace my life with the rise of the young-adult blockbuster. Precursors like The Golden Compass and Ender’s Game established that marketing to tweens could produce great works of genre fiction. Harry Potter created a global phenomenon that combined books and movies—Twilight and The Hunger Games proved the trend was here to stay. So I cannot guarantee you will feel as strongly about Kate & Sam Are Not Breaking Up as I did. But in short, the New Colony's production is required viewing for anyone who’s ever read a young adult bestseller. 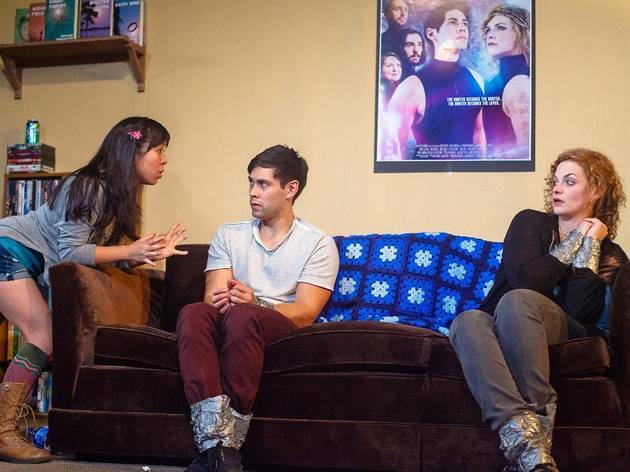 Joel Kim Booster’s new play is a hilarious, frightening, and clever comment on our time. While it checks every box—well acted, well directed, and engaging—it’s how relevant it is to our experiences that make it a resounding success. 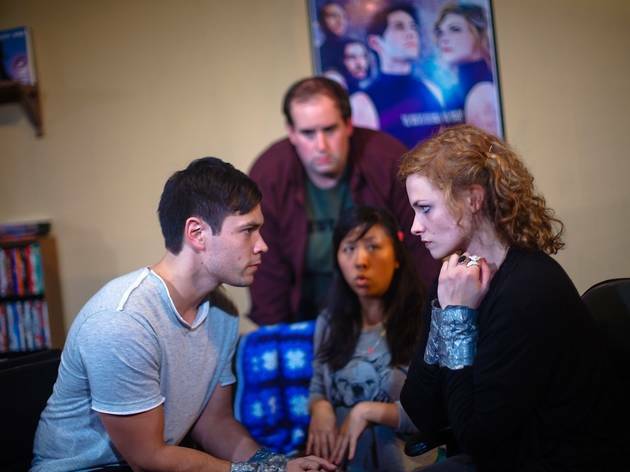 Sam (Nick Delehanty) and Kate (Mary Williamson) are the romantic stars of the book-to-film saga Ghost Forest, and maintained a relationship in real life until their recent torrid breakup. This prompts social pariah Bill (Rob Grabowski), with help from his obsessive internet friend Becky (Stephanie Shum), to kidnap them to restore order to the Ghost Forest universe. 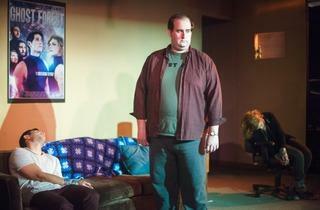 Kate & Sam establishes your expectations immediately with a mixture of laughter, discomfort and heart-pounding terror. Bill’s intentions for the couple are not clear, and their efforts to work together are hindered by their problematic history. While Sam has remained the adorable golden boy, Kate has rebelled against her character’s image with partying and drug use. The cast keeps you guessing at what sort of ending they’re working towards, and I’ll say no more than that the payoff is worth it. Thanks to brilliant worldbuilding, Ghost Forest is (sadly) believable as a tween sensation. The set’s books, posters and fake celebrity blogs so strongly resemble their real-world counterparts that you understand implicitly what this series is without explanation. A clever combination of sound, lighting and costume design allow Sam and Kate to occasionally show scenes from their addictive, melodramatic movies. 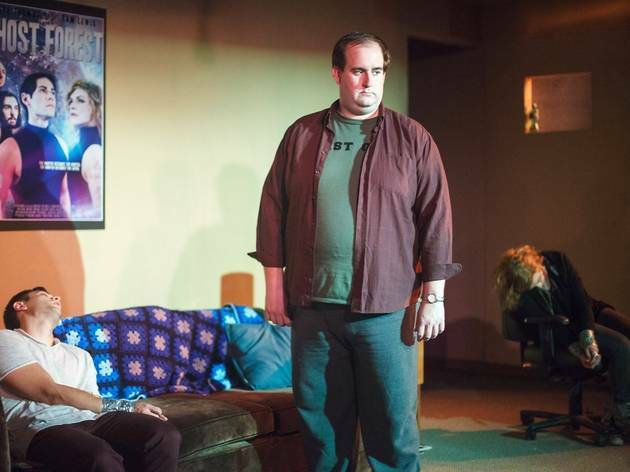 The play captures all of the problems with our relationship to mass-marketed stories. It touches on the painful reality overlap that occurs when celebrities become their roles and so steal our imagined characters away from us. It accounts for the dangerous toll it takes on the young actors thrust into stardom. And it explores how our shared experiences of a saga are simultaneously uniting and isolating. 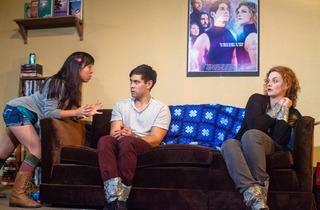 Most powerfully, the play addresses the unfathomable cruelty we direct at female genre actors. Fans are forgiving of a man’s portrayal and adore him regardless; the women are typically crucified at their first mistake. If the story belongs to anyone, it’s Williamson’s Kate, who despite being a spoiled, antagonistic brat will earn your sympathy before the end. Booster’s themes play through the story without ever committing to a single meaning or sacrificing entertainment value. Some plays resonate because they’re universal and timeless, or deliver astonishing performances; others perfectly capture a facet of our time. Kate & Sam Are Not Breaking Up is the latter, and the further away from the performance I get, the more I appreciate every question it raised.